It was Christmas day and I had one special Christmas wish. I wanted to see a snowy owl. My family and I were going out that day so I took a minute to ask God for a special Christmas present just from Him. I asked to see a snowy owl for Christmas! It was a bitterly cold day with wind chills in the -20’s, but snowy owls come down from the Arctic so they’re used to cold weather. As we drove to Christmas lunch in the next big town over my eyes were hard at work scanning numerous fields, poles, fence posts, irrigation equipment, trees, and anything else I thought a snowy might sit on! All the way home and all the way back and no luck. Later that day my dad and I went to visit my grandma. She had to miss lunch with us because it was too cold to take her outside. After a nice visit, we decided to drive an area where snowy owls have been found the last few years. It’s an area we have driven many times in the last two years looking for snowys, yet we’d never found one. So there we went, driving the loop and looking for anything out of the ordinary. 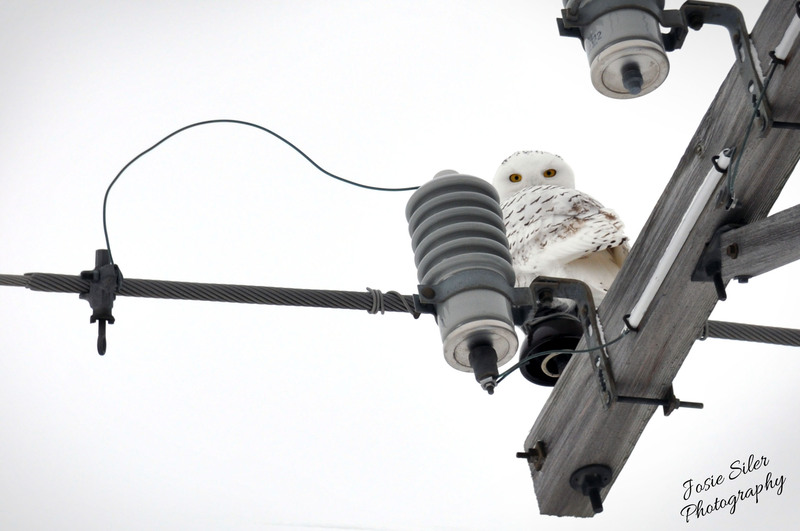 It’s challenging to spot a snowy owl against a snowy field, but we were determined. Plus, there was my Christmas wish, right? 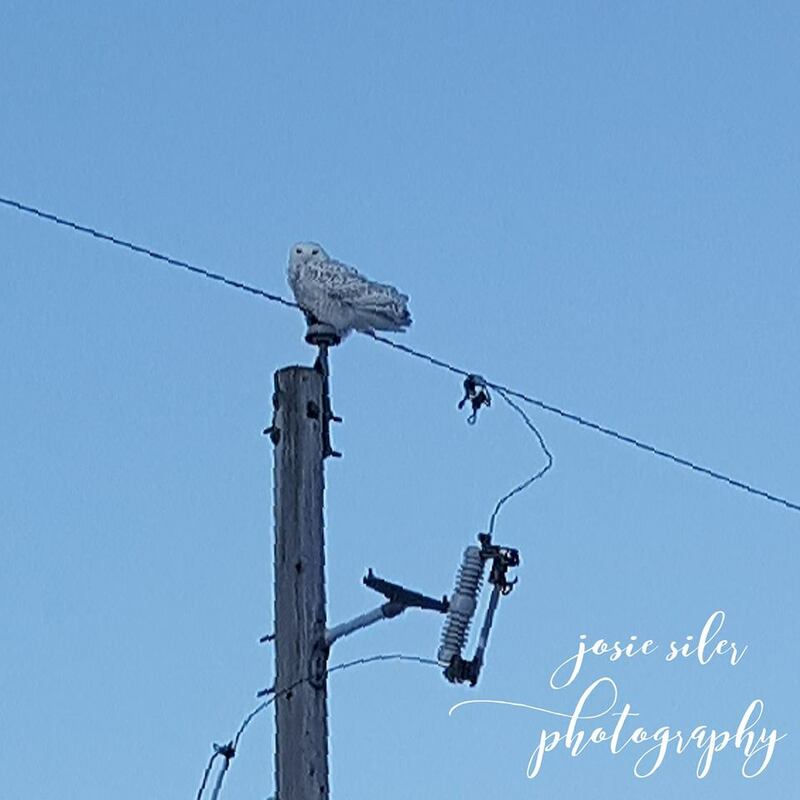 It didn’t take long before I yelled, “Snowy!” Dad quickly stopped the Jeep and sure enough, there was a beautiful snowy owl perched right along the road. It was as if she said, “Here I am, Josie, get a good look and enjoy your Christmas present!” She fluffed her feathers against the bitter wind, occasionally staring at us with the most piercing gaze I’ve ever encountered. Of course, I didn’t have my camera along, but I took pictures with my cell phone through the windshield. It was good enough for me, something I will remember the rest of my life. That first encounter was incredibly special. The next day dad and I decided to drive the loop again, just to see if she was back. We were still on a busy road when something out of the ordinary caught my eye. It was nothing more than a bump on a light pole, but sure enough, it was another snowy! My words tumbled out in an excited mess as I tried to tell dad what I saw and where. He spotted it too and we turned around to get a better look. Miraculously there were no cars coming so we stopped right underneath her. Dad opened the sunroof and I poked my head out and took some pictures. This time I had my camera with me! We were very careful not to stress the beautiful snowy, and she was as calm as could be hanging out and watching the world go by. We just stayed a couple of minutes and then we let her be. We decided to drive the loop anyway and see if this snowy, or the one we saw the day before, had any friends. Do you believe what we saw? That’s right, another snowy way out in a field! This one was male as he was much whiter than the two females we had already seen. I snapped some pictures, but he was too far away to get anything good. Three snowys in two days, wow! Oh, but God wasn’t done with my Christmas present just yet! Today dad, mom, Ruby Mae, and I were all in town together. We had to go on a little adventure and look for snowys so that mom could see one. On the way, I prayed that God would give us eyes to see a snowy if there was one out there so that mom could see one too. Along a new road we hadn’t been on yet, dad was the first to spot another beautiful snowy. Oh, she was glorious! This one was curious so we just stayed a minute. She watched our every move as we slowly drove by. Dad stopped for just a minute so I could snap a few photos and then we were off. 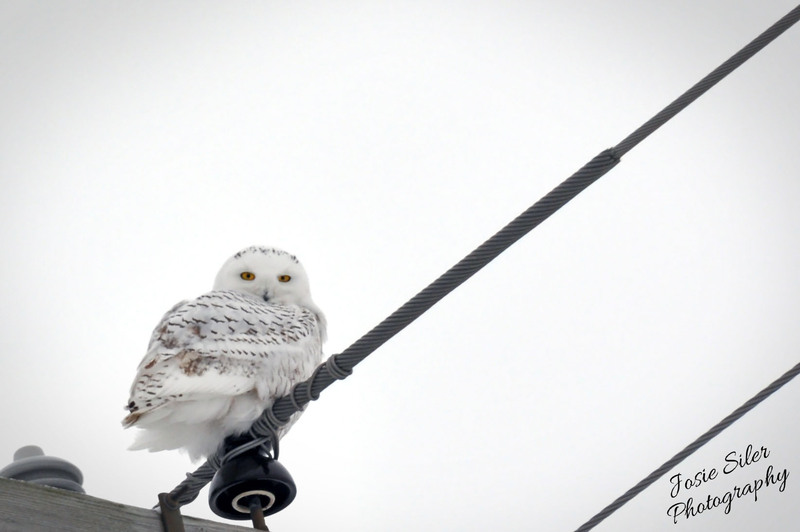 We’ve been looking for snowy owls for two years and I have seen four in the space of a week. What a blessing! It is such a great reminder to me that God gives good gifts to His children. 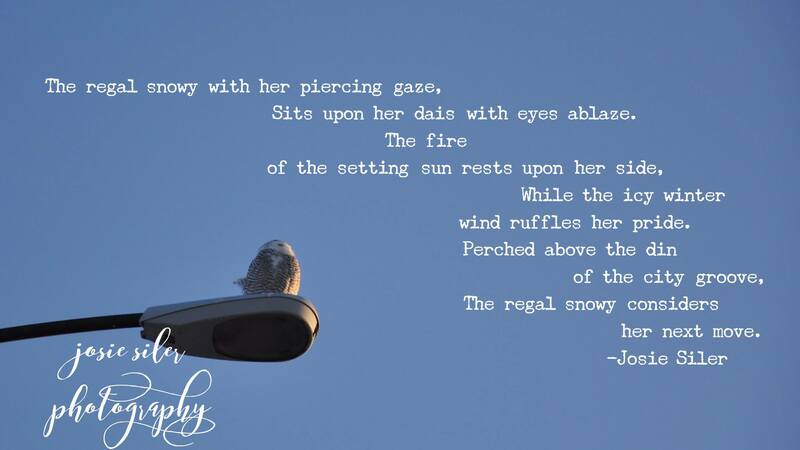 I was thrilled with seeing one snowy owl in my lifetime, yet God has lavished me with four… and I have a strong suspicion that there will be many more in my future. We just celebrated Christmas and as wonderful of a gift as these snowy owls are, the gift of Jesus is so much greater. He gave His life for us, and He came to give us new life. Not just life, but abundant life! God’s abundant gift of snowys reminds me of Jesus’ gift of abundant life. That’s the kind of life I want to live! I can’t wait to see what God has planned for 2018. I don’t know what it is, but I know that life in Christ is always an amazing adventure. Merry Christmas, friends, and a very Happy New Year!